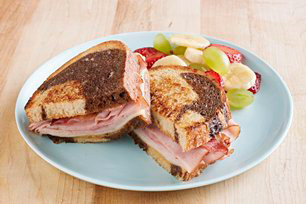 Served warm from the skillet, this hearty ham and Swiss sandwich is dressed with mustard and MIRACLE WHIP. Lunch is served! Spread bread slices with mustard; fill with all remaining ingredients except Miracle Whip. Spread outside of sandwich with Miracle Whip. Prepare as directed, using sliced deli reduced-sodium turkey breast. Serve with cut-up fresh vegetables and your favourite fresh fruit to round out the meal.